In the Indian workshops, block printing tables are covered by a piece of cotton cloth in order to absorb any excess of paint when block printing. When visiting one small factory we were given a piece of this cotton cloth, filled with layers and layers of paint and prints. I’ve decided to use it as a background for the challenge “Seasons” because the dark red colour looked like foliage during the fall. I’ve used distressed felt for the leaves because the way it shrinks reminds me of the damage caused by acid rain in forests. It was really challenging to use the unpredictable effects of the prints on the cloth to create this quilt. Printed cotton cloth from India and hand dyed fabrics – acrylic felt coloured with transfer dyes – metallic wax – gold thread and beads. Wooden blocks from India; Gold powder + clear binder to make the gold paint – Soldering iron and heat gun. 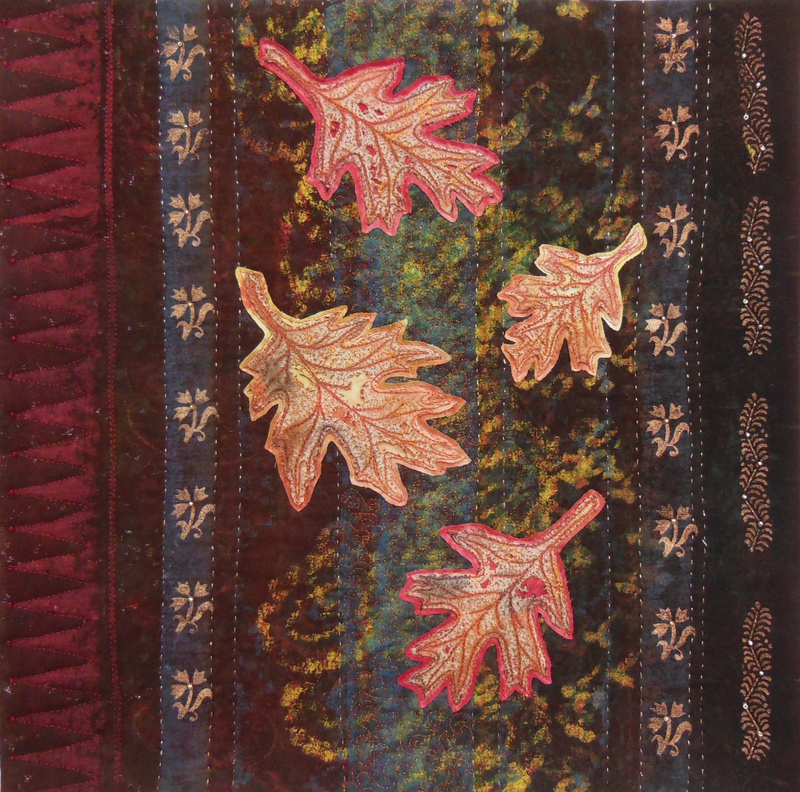 For the dead leaves : acrylic felt coloured with transfer dyes and distressed with soldering iron and heat gun. 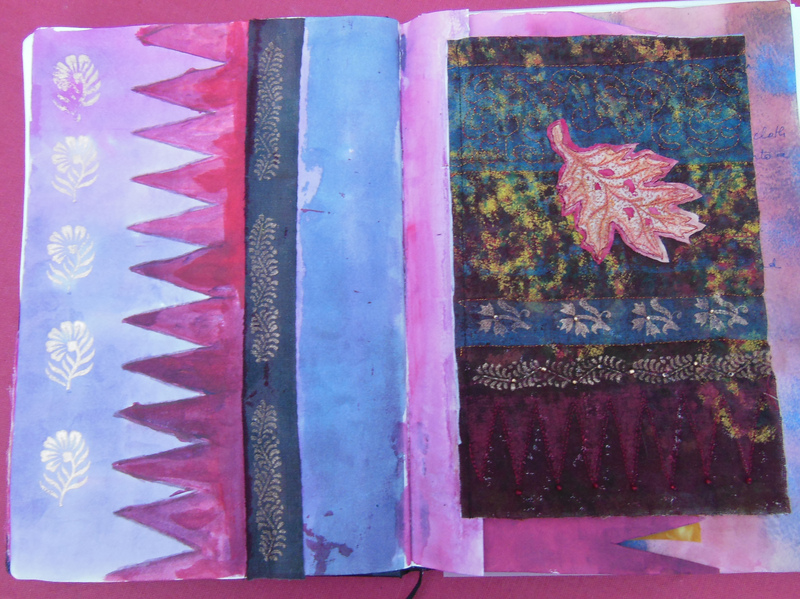 I’ve tried to highlight the blue stripes with block printing with gold paint. All the other prints were already on the fabric when I got it. 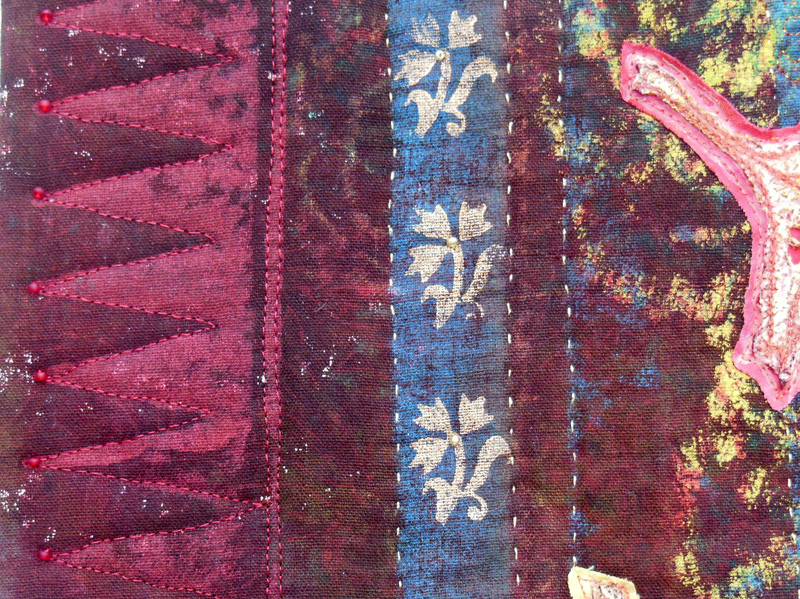 Free motion quilting and hand quilting with gold thread. A very different approach to this theme, Chantal, and an intriguing use of the fabric which in itself has a great back story. I left a comment already this morning, but it doesn’t show! Will try again. A lovely way of using your Indian piece of cotton.Beautiful autumn leaves. A lovely quilt, which makes such wonderful use of the gifted fabric. I think the sketchbook pages are a good idea to feature here, I may try add mine another time. A very subtle use of your fabrics which brings the autumnal feel piece, and the leaves are just right. A beautiful reminder of your trip and everything is in harmony, amazing for a cloth that was not intended to be the initial print. The leaves are a reminder of autumn and as you have said how they are damaged by acid rain. Well Done. Great use of the fabric! love for the leaves. Thank you for giving us the back story on the fabrics and techniques. The colors capture the fall, especially in the rich reds of the background. So nice how you use fabric that isn’t ment to be used. Very rich quilt with beautiful leaves and nice blockprints.